South facing with extensive views over the marina, sea and coast beyond, the apartment is conveniently situated for water-side restaurants & bars and just along side a safe sheltered beach. 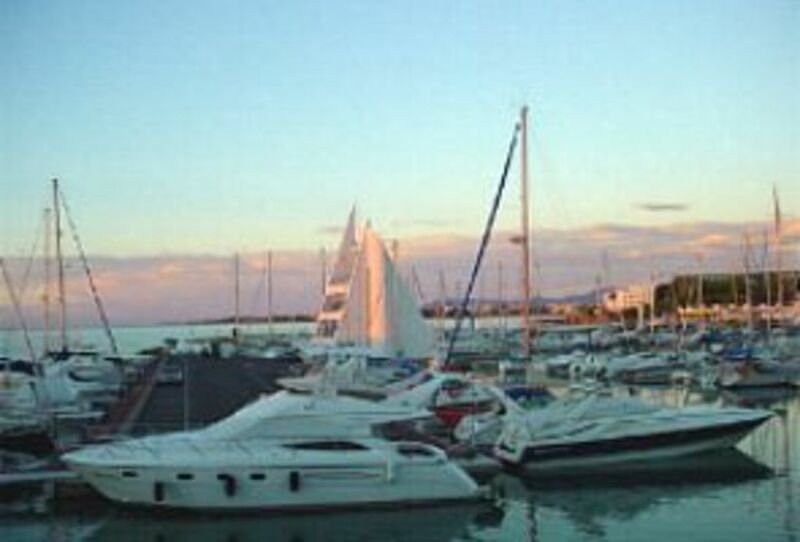 The marina offers not only sailing but a diving school too! Golf: There are two excellent courses within 30 minutes designed by Bernhard Langer and Sergio Garcia. Local interest: The local towns of Alcala de Chivert, Castellon and Peniscola with its ancient walled city, cobbled streets and panoramic sea views are within a 30 minute drive. Benicarlo is also about a 25 minute drive and has a daily fish and vegetable market. It also has an excellent train service to and from Barcelona and Valencia. A short drive inland and you will find yourself in mountains with villages that have not changed in centuries. The view, I never tire of it and many visitors who book year after year say the same. Table and chairs on balcony together with two loungers. The Apartment is in a great position in Las Fuentes. On the Marina watching the Boats and the Fish. There is an easy stroll to Alcossebre Town and the other way to the Lighthouse. A sandy Beach is beside the Apartments and on the other side are Restaurants and Bars. The Apartment has all that is needed to enjoy your stay. Very relaxing. Sadly, a great disappointment. The flat is in a stunning location,but,that did not make up for the fact that it was very dirty. We washed the floors the night we arrived. (no one to meet us,as promised).We spent the following morning cleaning. Pubic hair in the shower was the final straw. We left well before the end of our vacation, we were both badly bitten by what appeared to be bed bugs.We washed the sheets but that did not stop the problem. The local agent/cleaner appears to be unsuited to this job, and sadly is not doing the owner any favours.Our advice to the owner would be--GET A NEW CLEANER! Must remember not to rent to total nut cases, this women, this woman takes 6 months to complain about something that was not a fact. Having looked into this complaint I do find it astounding, for the following reasons. 1. If you had a complaint, you complain to the owner and HomeAway when you get back not wait 3 months. 2. We went there with friends a couple of days after they left for two weeks, I can't believe that the bed bugs would have singled them out for biting and not us. 3. This couple had booked with us before and on the way driving down she had been mysteriously taken ill. Obviously we could not return their money to them at that late stage but did take £200.00 off this booking. 4. Meeting the guests, we always ask clients to let us know when they expect to get there and to ring the couple who look after the apartment an hour or two before they get there. This particular couple said that they were driving lazily down and expected to be there around 8.00pm They had estimated a drive that had taken me over 8 hours with just one short break to take them 6, so they may well have been late. We naturally then have to make other arrangements in order to get the keys to them. In one case recently we had someone say that he was going to have to stay in a hotel for the night with his family as he would not be getting there until 2.00am, so we made other arrangements to save him an extra cost. A lovely property containing everything you could wish for when self catering, brilliant situation for touring the area, would definately stay there again. Am delighted that Mandy liked the apartment so much but frankly if everyone who told us how much they liked it and came back to stay did a review there would be no room for the add, but am very grateful that she did and loved it as much as I do. Thank you so much for renting out this fabulous apartment, we spent a wonderful week there and enjoyed every minute. The apartment was very clean and bigger than we expected. Even with 2 small children we settled in instantly, however after what turned out to be a longer journey than expected from Valencia airport which is actually nearer 75 miles away than 60. The beach was lovely and clean and the little streams of fresh water running through were perfect for our little girl to splash in. The only downside was that the area itself is quite expensive to eat out but we had lovely meals on the balcony whilst overlooking the marina. I also would have been grateful to be informed about the toll bridge charge which cost us 8.50 euros upon leaving the motorway when we arrived, which we weren't expecting. Altogether a superb apartment which we would recommend to anybody and would definitely like to return to. This was our second visit to the apartment and again it did not disappoint. Although in itself the rooms are not spectacular, it is the fact that you are on (in) the marina and have some great views that made it for us. In addition to the location the local restaurants and bars are all very nice, we particularly liked Loli’s Bar and the L’Ille restaurant, you must try their lamb chops. Another nice place to eat is Sancho Panza’s, the pre-dinner sherry and post-dinner schnapps are a nice touch, although I think he does charge for them. The property is well maintained, although one of the blinds to the balcony didn’t work, no biggie and they did say it was being replaced, and with two bathrooms it makes everything comfortable. The beaches are extremely clean in Alcossebre, just watch out for the cold fresh water which goes into the sea behind the apartments. This is definitely a place I would recommend to a friend, it’s not flash but just to be able to enjoy the view does it for us. Luc was a great guest to have and would be welcome anytime. The twin towns of Alcossebre and Las Fuentas are 2 hours south of Barcelona and one hour north of Valencia. They nestle amongst orange and almond groves and are typical of this picturesque region of ‘Costa Del Azahar’, one of the last unspoilt areas of the Mediterranean coast. Both have numerous excellent restaurants, plenty of shops and wonderful safe sandy beaches.